Marigold at a flamenco night with our friend Kay. Looking cheerful. We’re on the road for a few days. 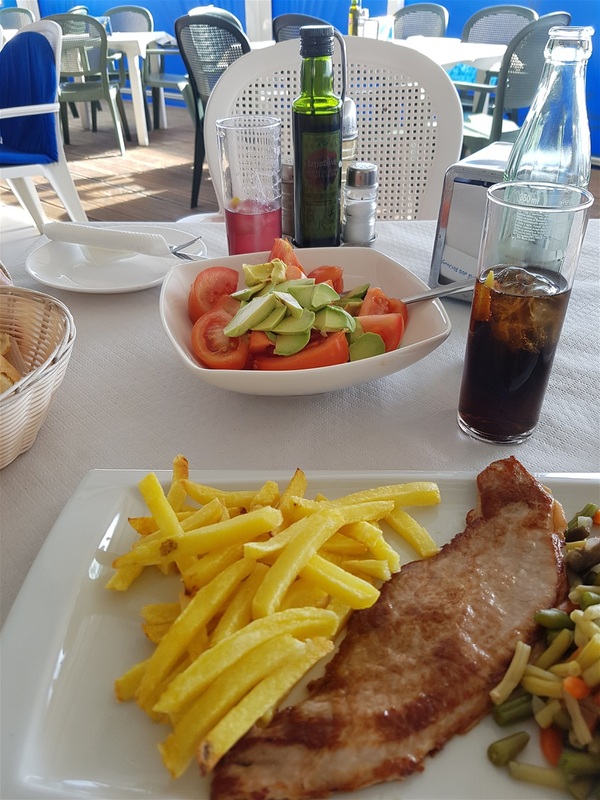 Today we're in Algarrobo, on the coast not the town, taking our ease and debating whether or not to head off into the hills or stay where we are. Algarrobo is an interesting place. More than one, actually. 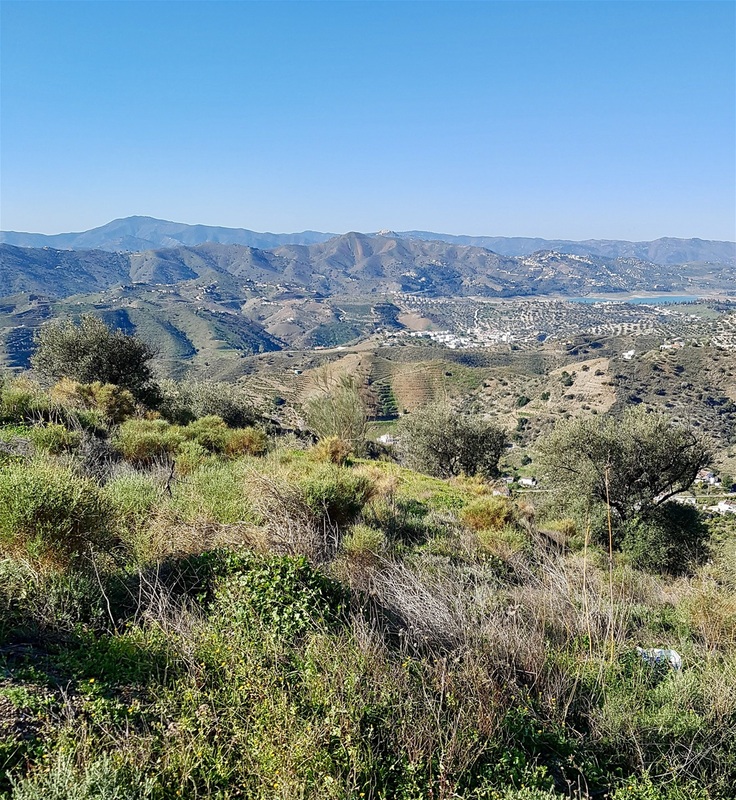 The old town, halfway up the hill towards Competa, is steeped in history while the ‘new’ version, on the coast, is all high rise holiday apartment blocks and a mile long promenade. Algarrobo is also the name of a tree, perhaps more widely known as the Carob tree. They're protected by law and a record of all trees is held at the town hall. There are five fine specimens on the land we used to own and they were a great attraction for herds of goats. Carob pods are sweet and widely used in powdered, chip, or syrup form as a confectionery ingredient and as a substitute for chocolate. We’ve munched our way through the dried pods from ‘our’ trees on many occasions. Not as tasty as chocolate by any means, but palatable enough. Unlike chocolate, it is caffeine free and hence better tolerated by animals, and ‘chocolate flavoured’ treats for dogs in pet shops are invariably carob based. Interesting facts coming up. Carob seeds are absolutely uniform, in both weight and size. In ancient times this made them invaluable as a means of weighing precise quantities with predictable accuracy. Gold and precious gems were traditionally weighed against the seeds of the carob tree in biblical times. The system was eventually standardised using a derivation of carob – the carat - and one carat was fixed at 0.2 gram. In Roman times, the pure gold coin known as the solidus weighed 24 carat seeds, about 4.5 grams. As a result, the carat also became a measure of purity for gold. Thus 24-carat gold means 100% pure, 12-carat gold means the semi precious metal contained 50% gold and so forth. It's been distinctly chilly for the past few days so we're moving around a bit seeking warmer pastures. There's snow on the hills, but not even a single snowflake on the coast. This isn't normal weather for Southern Spain and snow has been falling in areas which have not seen snow for a generation. Not here though and the sun is shining brightly. A couple of, shall we say, mature years have parked themselves against a wall in front of me. 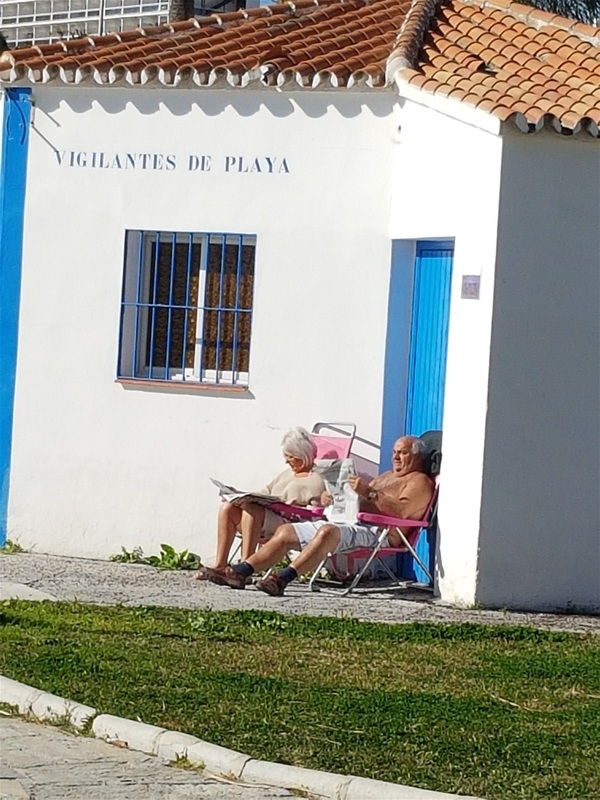 They look comfortable, soaking up the sun, bothering no-one, and we exchange a smile of shared pleasure at our surroundings. People watching on a warm sunny afternoon while sitting in a promenade café overlooking a sparkling sea has to be one of my favourite ways of passing the time. Even better when snatches of conversation are added. Mostly, the words are mere snippets with little relevance outside the context in which they occur and as we travel a lot there's the added inconvenience of overheard speech being mostly incomprehensible. 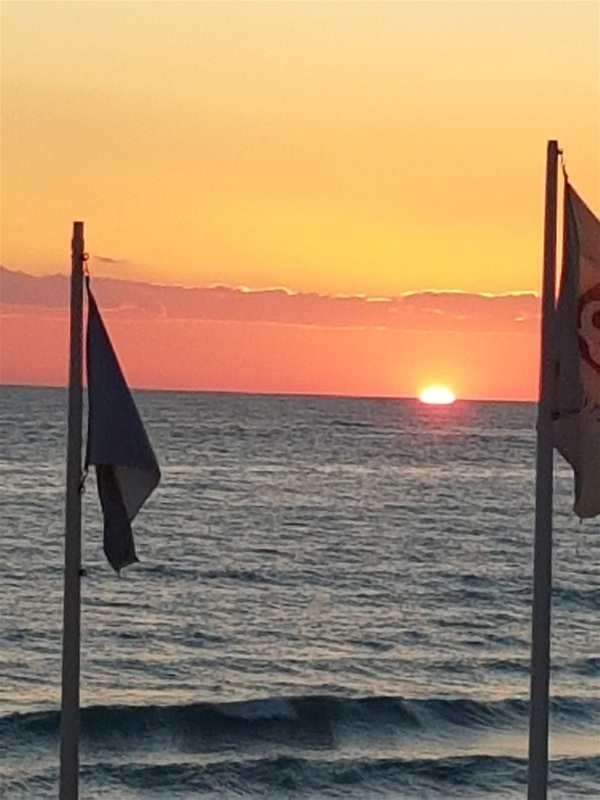 Later the same day we saw them again in a beach bar we’d wandered into that evening as it had live music. Marigold decided we needed to be out and about and the first place we entered turned out to have British owners. A friendly enough bar, but with most of the patrons watching the big screen television. A quick glance was more than enough for me. ‘Let's go now,’ I said. I live my life within boundaries, established over many years, whereby I have, at best, a 49% share of the decision-making process. From choice, I hasten to add. It suits me to be a facilitator rather than an instigator, most of the time. I go along. When I’m not doing Marigold’s bidding, I prefer not to follow current fads and fashions. I find the basic concept of being a follower difficult. I can't get worked up over most of what's ‘popular.’ Television programmes for example. But, look, here’s the choice – watch celebrities I’ve scarcely heard of prove they can’t dance, then observe truly talentless people being praised to the skies by judges whose very appearance on my television screen provokes me to ungovernable rage. That’s one option. The other is to do something else. Not much of a quandary, eh? Doing something else is certainly called for. As a footnote, I should point out my former claim of having only a 49% share of decision-making has been derided. Apparently, I get my own way ‘99% of the time, at least.’ Obviously, I welcome debate and readily allow for alternative opinions. I feel I have to include this codicil or face as yet undefined sanctions. Footnote added as instructed, under duress. If I could be bothered I’d argue the point, but there’s the dilemma du jour in a single sentence. Agreement reached, we moved on, into another bar with a live band. We found seats and there, right next to us, were the two nurses we'd sat alongside earlier, now even more merry. 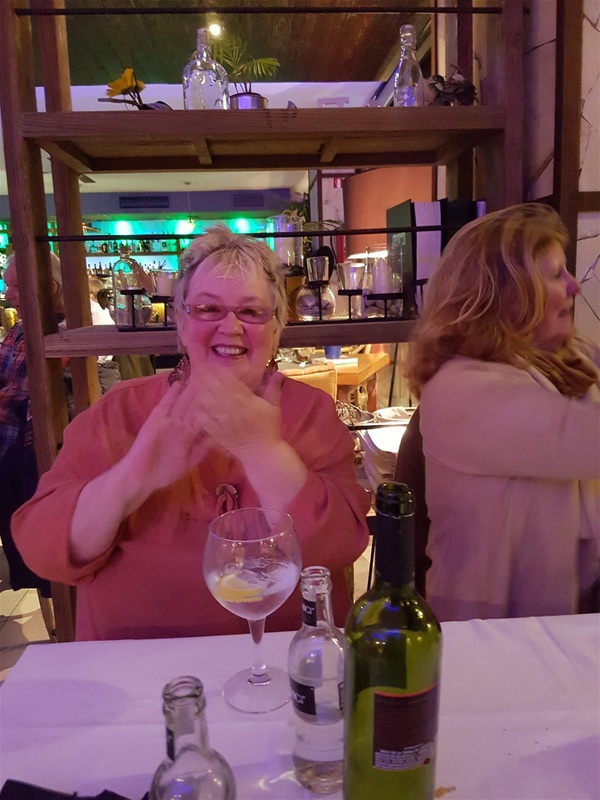 Marigold nudged me to pay attention as they discussed a persistent older admirer – no, not me – who’d asked one of them to join him on the dance floor for a slow number. Priceless. Who needs a live band when the audience provides the best entertainment? The next day, Sunday, we rolled up at a car boot sale. 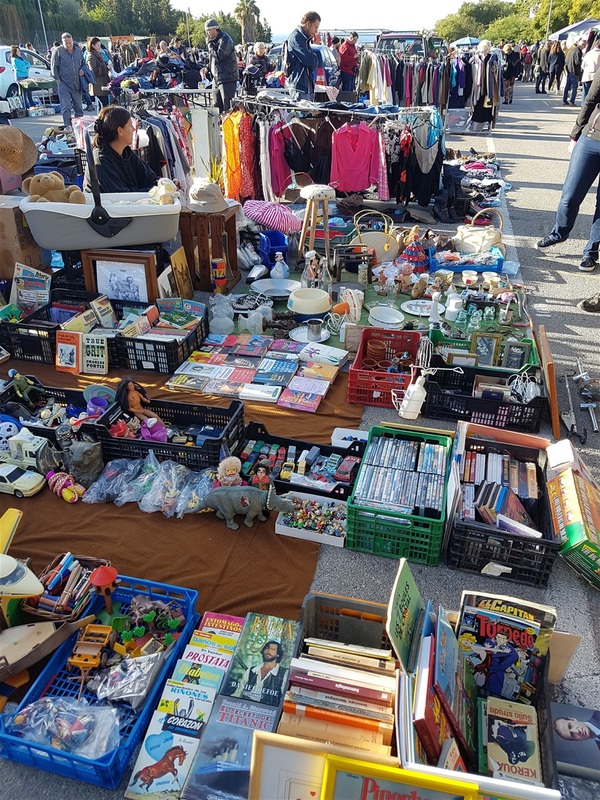 No, a car boot sale is not typically Spanish but where there's even a handful of Brits in the vicinity you can guarantee there'll be fundraising for abandoned dogs and a car boot sale. We browsed contentedly for an hour or so. We don't actually need anything, but we rarely let that sort of thing become a hindrance. 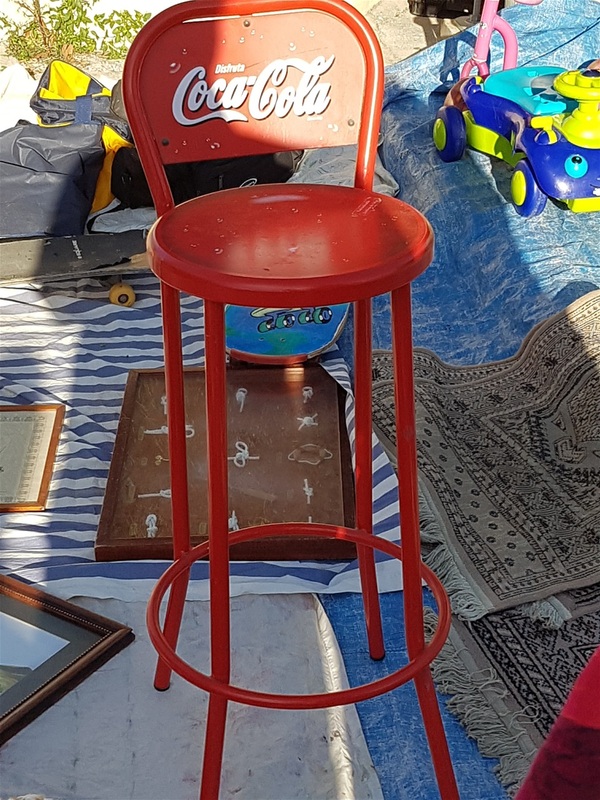 Marigold's eye was caught by a red Coca Cola high stool, ten euros but I knew I could get it for eight, perhaps even seven. ‘It's fab, isn't it,’ she said. ‘Where would we put it though and it will take up loads of room in the car,’ she continued. I said nothing as she was rapidly talking herself out of buying what had been an irresistible object only a minute or so ago and so it proved. 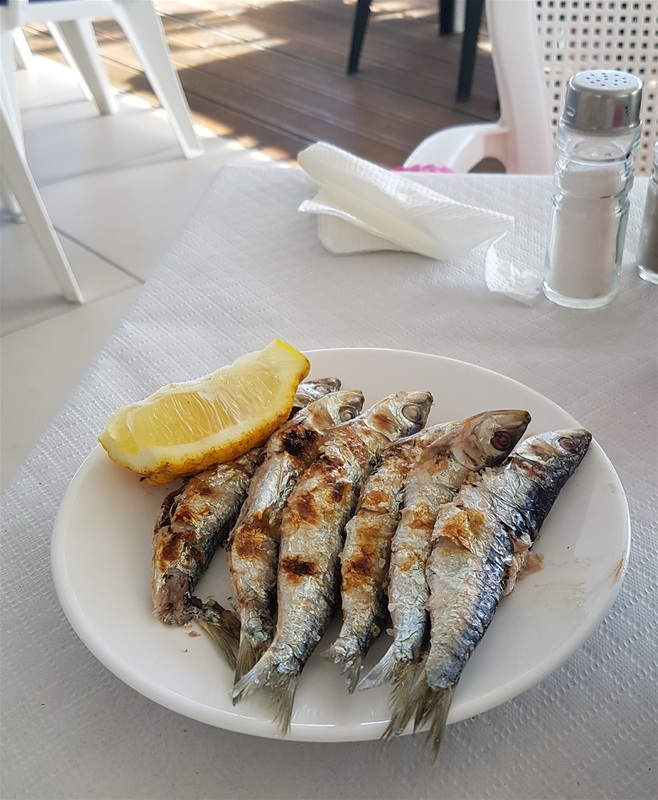 ‘Eight euros, very fine stool,’ the stall holder called out as we walked off, reinforcing my belief he would have accepted seven euros, maybe even six, but it was not to be. We’d scarcely finished congratulating ourselves on our sound financial acumen when we somehow found ourselves buying two pictures on the very next stall. Original art and very much to our taste. Where to hang them and where to put them while we wait to find suitable wall space is a problem yet to be resolved. There's so much here. Much of it is tat admittedly, but there are treasures too. 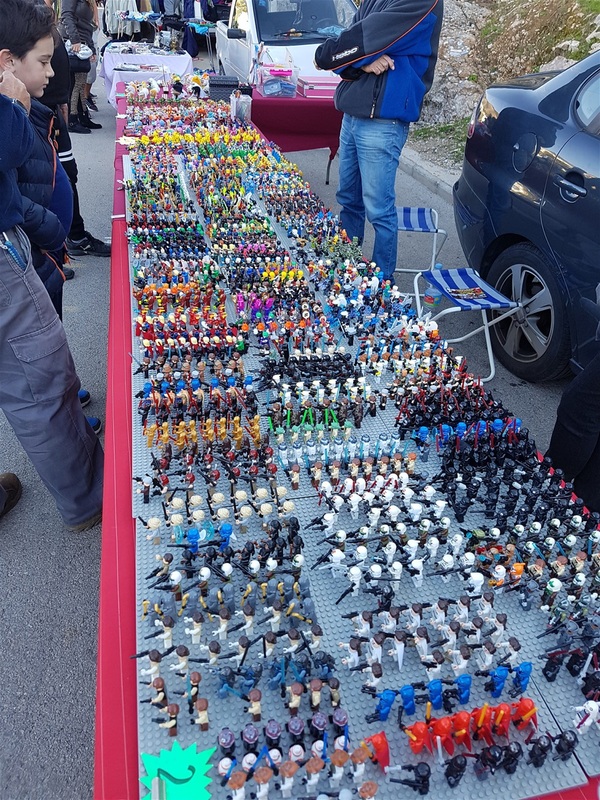 A stall selling model soldiers, no longer made of lead, I assume, is doing brisk trade and there's any amount of second hand clothes in my price range, i.e. 3 euros or less. 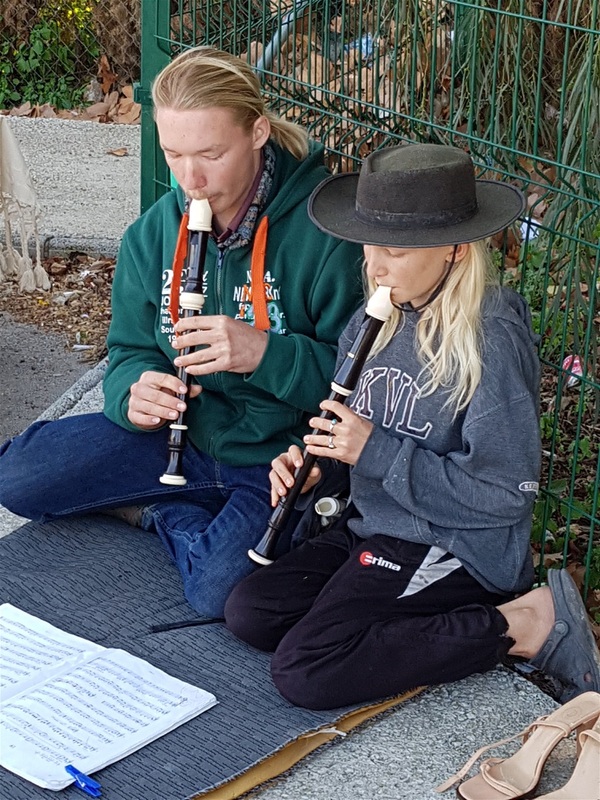 A young girl and her father are sitting under a big tree playing recorders from sheet music in front of them. It's advanced stuff, a very complicated piece, and they're both note perfect. 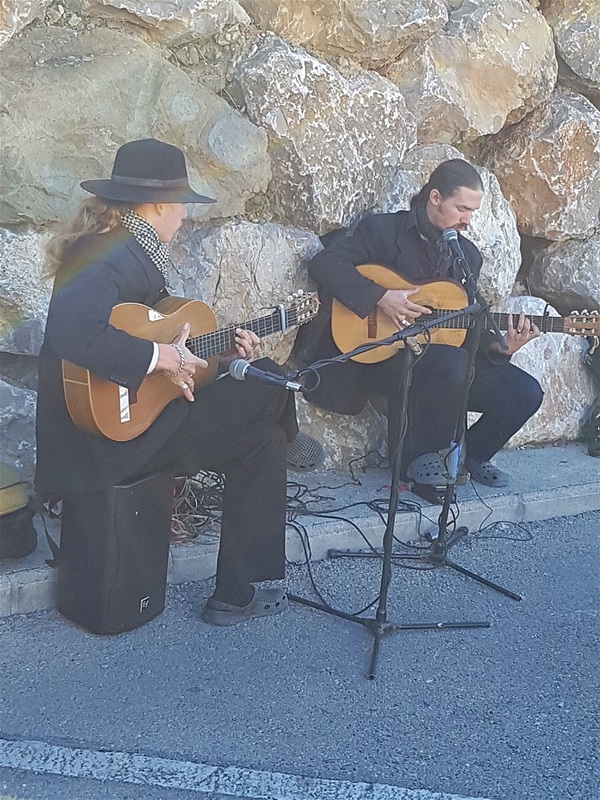 Further along are two men playing classical flamenco guitar, again the standard of playing is breathtakingly high. We add a coin or two to the pile at their feet. Marigold stops abruptly and her expression tells me she's overheard something I’ve missed. Not unusual, this, as I have dud ears while Marigold misses nothing. It's a man ringing the owner, on whose behalf he's selling a (rather nice) armoire, to ask if he will accept a lower offer. He holds his pose, mobile phone clamped to his right ear and gesticulates. So specific, five minutes or half an hour, the mind boggles. The would-be buyer, draped in fur and over the knee boots, pursed her lips with an expression of distaste. ‘I’ll come back in an hour,’ she said and stalked off. We have lunch on the beach. Sardines for Marigold, cooked on a log fire by a jolly fat man. He's also cooking sea bass and there's a faint hint of a hesitation before Marigold decides to go with her original choice. Years ago this was a regular Sunday morning routine: browsing the car boot sale and then sardines on the beach. 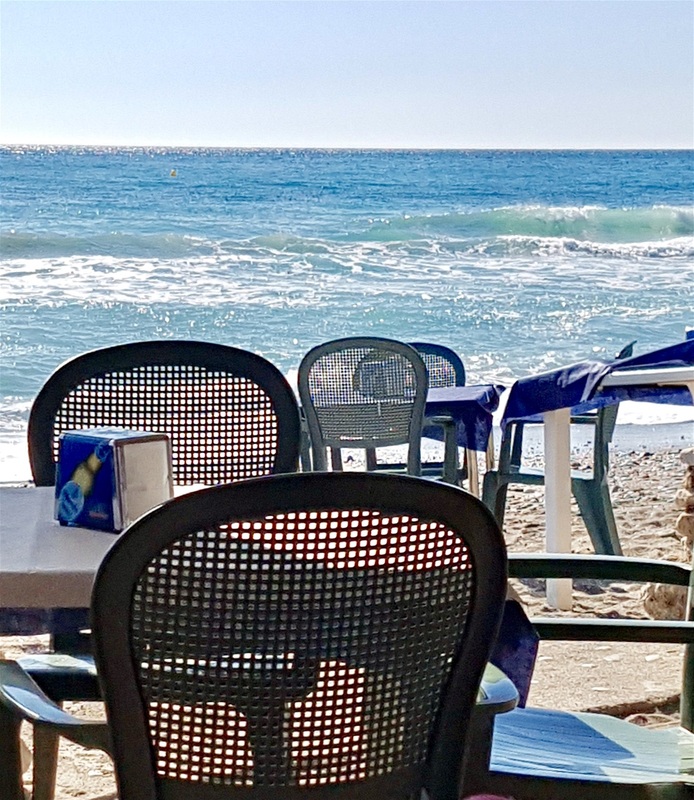 The setting is perfect, the food is good and there's a lively puppy running around getting under the feet of the waiters but tolerated in typically Spanish laid back fashion. After lunch we set off for the hills. Marigold says ‘Canillas de Aceituno, por favor’ and off we go. We spent many hours in this village back when we were renovating ruined houses. In the bars having tapas, in the Town Hall filling in forms and in the builders’ yard ordering sand, cement and roof tiles. 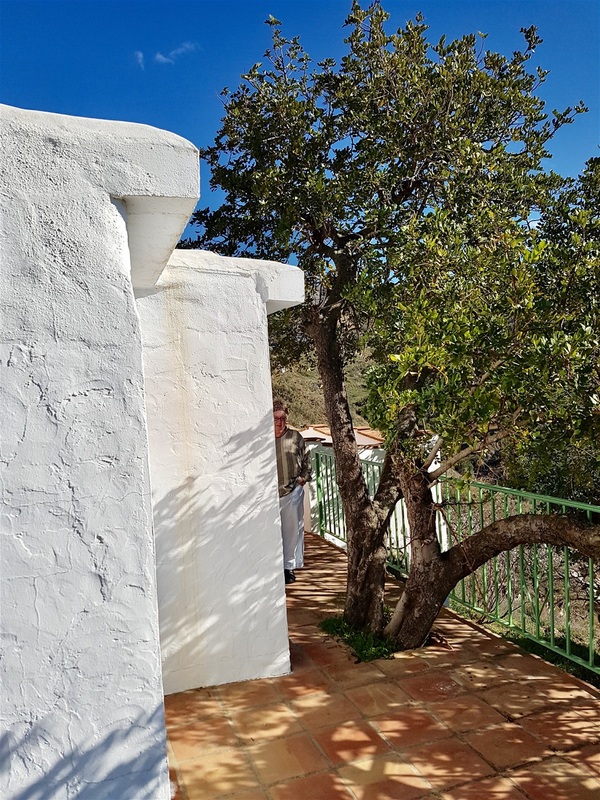 It's a lovely village with stupendous views, very Spanish in the old traditional style and we even meet and say hello to the man who used to deliver sand and gravel to our ‘building site surrounding a ruin which may be a finished house one day’ finca. Occasionally, he even managed to arrive on the day we had arranged the delivery. Not very often though. We drove along a familiar dusty track to look at the last house we sold in Spain. It was deserted so we could wander around. 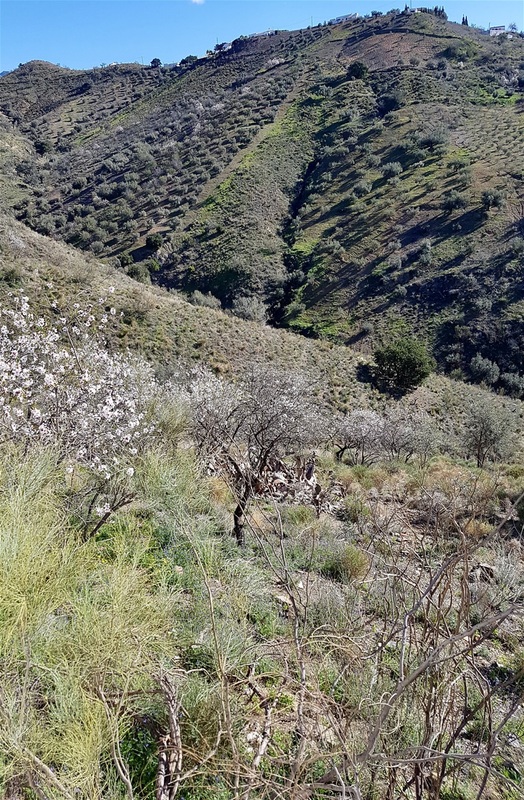 The almond trees were covered in blossom, brightening up what would otherwise appear a vast acreage of scrubland. Land is cheap here and our old finca certainly had a lot of it, but its value was only ever confined to being able to gaze out over one’s own land. This isn't Downton Abbey. The five Algarrobo trees are still there and we eat a couple of pods for old times’ sake. Like so many things from a previous era, they are disappointing. High above us, a pair of soaring buzzards, supported by outstretched wings, swoop and glide in the clear air, their button eyes alert for the slightest movement on the ground beneath. One drops vertically, to earth, its cruel hooked beak and talons ending the life of some unfortunate creature, then soaring upwards with its prey and re-joining its mate, swirling wings taut, as they ride the thermal up-drafts from the baked scrubland far below. We walk further along the track and gazed wistfully at the sole remaining piece of Spanish land in our actual ownership. We never bothered to sell it and, for what it would have fetched on the open market at that time, it was a wise decision. We’ve brought our camper van here and stayed a few days, on our own land, and will do so again one day. It's on National Trust land so building a house here would be next to impossible. Restoring an existing house, even if it's a ruin as ‘our’ house was, is okay, but to get planning permission for a new build you’d need to be a very close relative of the Mayor! We’d considered erecting a mule house at one time as that may have been allowed. The man who suggested this told us we could include a bathroom and kitchen in the ‘mule house’ and live in it as nobody from the Town Hall ever bothered to look inside. He also told us he had seen a bear, several times, on the slopes of Mount Maroma, so he may not have been the most reliable informant. 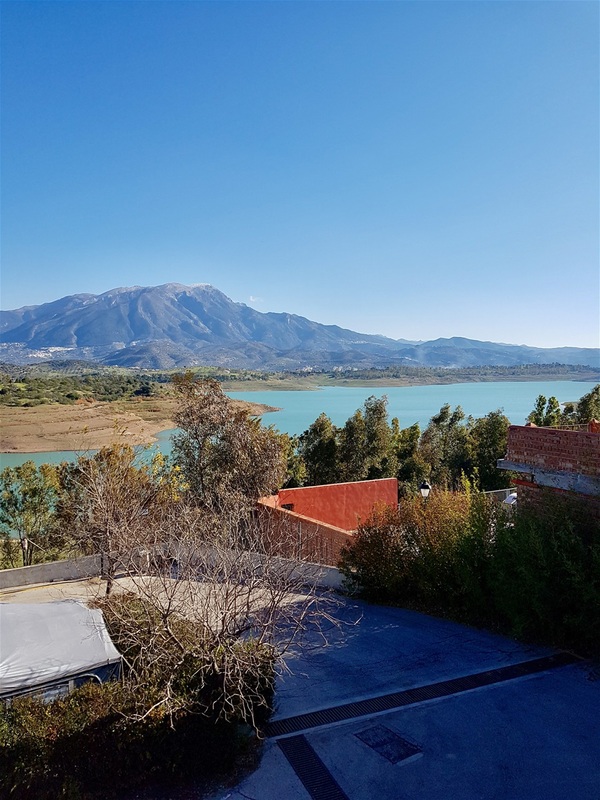 It's a lovely spot, overlooking the sea on one side and Lake Vinuella and the distant mountains on the other, even though the lake itself, once gloriously blue and filled to the brim is now almost a puddle! We consider walking down to the bottom of our hillside to see if the little stream is still there, but Marigold tells me a blister on her toe is troubling her so we’d better not risk making it worse. ‘Do you want me to take a look at it?’ I enquire. Marigold nods and we set off back to the car with me supporting her every step with an expression of the deepest concern on my face and Marigold failing to suppress an outbreak of giggling. A nostalgic afternoon, but we're moving on. Places to see and things to do. 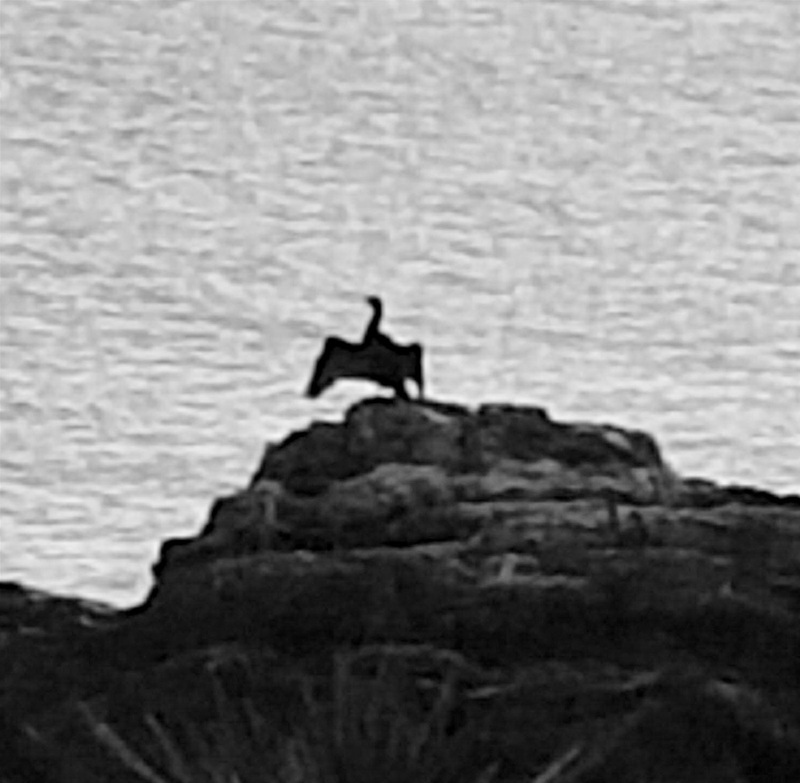 Onwards, ever onwards. Blister permitting. Headline of the year in local free paper. Pure genius.